Journalist, diplomat, author and former Europarliament member Lasse Lehtinen writes on his research on President Kekkonen’s (President of Finland 1956-1982) complicated relationship with the Soviet Union. Lehtinen, a member of the Social Democrat Party of Finland (SDP) with a Ph.D. in political history, has studied Finland’s politics during the Cold War. The original Finnish article “Miksi Kekkonen pelkäsi?” was posted on his Europarliament webpage in 2006 (see the link for the numerous references to literature) and later published in a book “Vuorovaikutuksia: Timo Soikkasen juhlakirja” in 2007. Adolf Hitler began his attack on the Soviet Union in 1941. Finland joined the war only three days later with the purpose of reconquering the occupied territories lost in the Winter War of 1939-1940. Urho Kekkonen was very excited by the possibilities offered by the new war. He thought it was “fortunate” and he was eager to push the borders of Finland far with “the justification of history” – all the way to eastern Karelia, Kola peninsula and Aunus. Next year the fortunes of war were different for Germany. In November 1942 Kekkonen with his friends were gathered together in Rovaniemi with some cognac to consider the situation and the future of Finland. The result was a complete turnaround that had tremendous consequences for the post-war foreign policy of Finland. Kekkonen completely forsook his past stands and opinions. So, soon was forgotten in the dark corners of history the eighth grader from the Kajaani middle school who sought volunteers for the Aunus expedition as well as the eager interrogator Kekkonen of the central police and the Minister of Interior for the Agrarian League (AL) who had imprisoned communists in 1939. Being then over 40 years of age Kekkonen buried with much care the deep-rooted anti-communism he had been so engaged with. He then personally allied with the forces that he had fought against for a quarter of a century both in words, writings and actions. The reformed Kekkonen had nothing to do with the man who had sought to conquer eastern Karelia and had stood against the peace pact that ended the Winter War. Immediately after the peace was forged in the autumn of 1944, Kekkonen created “working relationships” with KGB, the Soviet intelligence organization. Kekkonen became the foremost ally of the USSR in Finland for nearly forty ensuing years. With his new course set, Kekkonen was thoroughly consistent to the end. He never at any circumstance gave a statement in public that could be seen as antagonistic towards the USSR, its system or leaders. In the contrary, he repeatedly asked the Finnish public, press and civil servants to abstain from any criticism towards the Soviet Union. The President of Finland Urho Kekkonen giving his New Year speech in 1959. The admonition was well heeded. As the only western country the Finnish state signed a communique in 1974 that in behalf of the Finnish press promised “not to damage the advancement of the friendship between the [two] countries.” As late as 1983 the Union of Journalists in Finland included in their guiding principles self-censorship “in harmony with active and peaceful neutrality founded on Finland’s Agreement of Friendship, Cooperation, and Mutual Assistance with the Soviet Union” (the agreement is known as the YYA Treaty). Many witnesses to the events have said that in the relationship that Kekkonen had with the Soviet Union there was a layer of some additional caution. All in all, Kekkonen seems to have believed to the end that communism would in some shape or form come on top in the conflict of world ideologies. Former Prime Minister Kalevi Sorsa (SDP) thought that Kekkonen was “extremely interested in” the Soviet relations, at times very nervous when for example there was no meetings scheduled. “Then it felt like he did not understand his own value in the eyes of Moscow,” he says in his memoirs. “Not once did I hear him make a joke on anything relating to our mighty neighbor. Those topics were always dead serious.” Old and tired Kekkonen opened a letter from Leonid Brezhnev (General Secretary of the Communist Party of the Soviet Union, CPSU) “hands shaking” even when it was one of the last months of his presidency. Kekkonen’s facade was a staunch capitalist also when Russians were present. During a state visit in 1960 said he: “Even if the whole Europe would become communists, Finland will remain a Nordic democracy, if that is the will of the people, as I think it is.” Nikita Khrushchev was very amused. However, when western countries treated Finland as one having a special status, as a finlandized state for which regular western rules did not apply, Kekkonen was indignant. The situations became often embarrassing when Finnish diplomats claimed that Finland would in all cases make its own decisions “independently”. 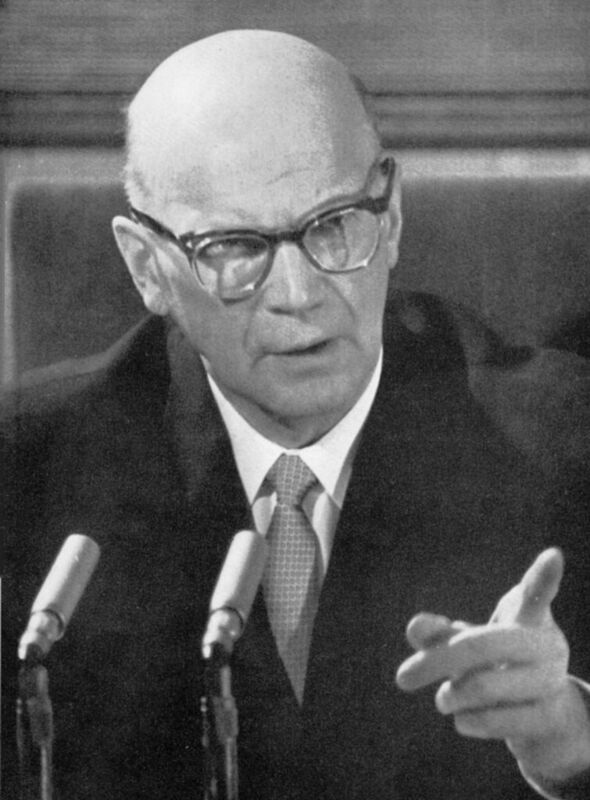 Kekkonen made it a habit from the start to conduct the most important discussions without a single Finnish witness. Soviet translators where only used. We may never know what was discussed in the sessions that on occasion lasted for hours. The emphasized caution that Kekkonen demonstrated with the USSR, or even a reliance, was visible in two incidences traumatic for Finland: the so called “Night Frost Government” and the “Note Crisis”. The Finnish People’s Democratic League of the political left was the winner of the 1958 Parliament elections, but neither the social democrats nor the right wing of the Agrarian League wanted it in the government. After the elections Kekkonen initiated negotiations that led to a new government to be formed by the Agrarian League, the National Coalition Party and the Social Democratic Party. The foremost concern of the Soviets was the fate of the left wing social democrats, the Skogs (after Emil Skog). They were a new Soviet tool in Finland’s internal politics. However, the re-election of Kekkonen was crucial for the USSR also in the formation of the new government. Before the new government was appointed, the USSR embassy began to slander the to-be government. Kekkonen was told with no uncertain terms that the USSR didn’t have confidence in the planned government. Kekkonen gave in immediately and withdrew his budding support. He was very worried about his own standing. The Parliament rallied for the defense of parliamentarism. The majority of representatives from the Agrarian League realized that the space of Finnish internal affairs was threatened and could be diminished for good if the negotiations for the new government were halted due to foreign pressure. Parliamentarism won, but only the first round. The reluctant President was forced to appoint a government that had a large majority of 137 out of 200 representatives in the Parliament. Kekkonen didn’t hide his disapproval in his appointment speech and privately scolded Virolainen who became the foreign minister in the new government – he was not willing to break the coalition and thus let Kekkonen off the hook. Two weeks after the appointment of the government, Ahti Karjalainen (AL) met his KGB contact Viktor Vladimirov and was eager to receive instructions on bringing down the new government. According to several eyewitnesses, Kekkonen was reacting to the crisis both physically and psychologically. His weight dropped by several kilos in a short period of time, and he was insecure, undecided and nervous. The government led by K.A. Fagerholm (SDP) tried to be especially accomodating in foreign affairs towards the USSR. Fagerholm said in his memoirs thatno one could afterwards point out a single inappropriate act in foreign affairs made by his government. Not for a moment did Kekkonen back up this Fagerholm’s third government he had appointed. The previous President Paasikivi (National Coalition) had done so in 1948 – 50 in very similar circumstances even though that was the time of the Allied Control Commission in Finland. Fagerholm’s was the last Finnish government formed during the Soviet era that was formed so that it was the parties themselves deciding the government, its program and ministers. The governments that followed had to not only have the backing of the Parliament but also that of the USSR. Soon the political parties learned the weed out those not fitting to foreign policy demands. The Soviet Union had thus taken the role of a decision maker in the internal affairs of Finland. Ultimately, Fagerholm’s government did not withstand the pressure it was facing in foreign affairs and trade policy. For the rest of his life, Kekkonen had to explain again and again how the restricted national sovereignty was a “success” and, in the end, granted more latitude towards the West. In a similar fashion, the “neutrality of Finland” became a phrase discussed and sometimes disputed in the internal state communications, but fortunately that was never put to an actual test. After Fagerholm’s government was taken care of Kekkonen swore that never would he appoint a government that was known to be heading to a dead end in foreign policy. He thus admitted where a final say also with the internal affairs of Finland originated from – the Russian embassy in Helsinki, often called Tehtaankatu by the street in Helsinki it’s located on. Kekkonen had tested his wiggle room as the President and came to realize that Moscow did not like him having much as one that they had helped into that position. There was a carefully set up and well-performed appreciation ceremony to honor Kekkonen in Leningrad in January 1959. Before this meeting with Chairman Khrushchev, Kekkonen was tense and had again health issues. The occasion was like a mob family get-together seen in movies when there is a celebration after a crisis has been resolved. Kekkonen had successive discussions with Khrushchev lasting as long as six hours. Cheek kisses were exchanged and Khrushchev called Kekkonen “a man of trust” and finally left much of the practicalities in Finland for Kekkonen to take care of. The smiling Khrushchev emphasized repeatedly that the USSR was not interested in meddling with Finland’s internal matters. It is no wonder that Kekkonen had his stomach in a knot. 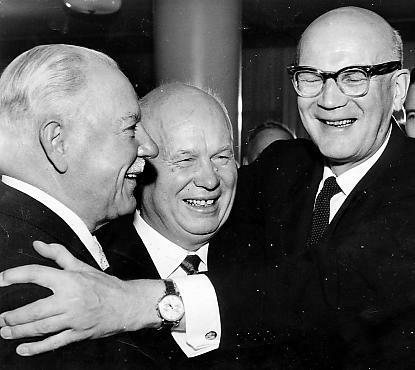 President Kekkonen (on the right) having a laugh with the President of the Soviet Union Kliment Voroshilov (left) and CPSU chairman Khrushchev during a Moscow visit in 1960. In 1960 the so-called Honka alliance was formed. The circles opposing Kekkonen rallied one last time for the upcoming 1962 elections. The goal was to replace Kekkonen with a new president, namely the Chancellor of Justice Olavi Honka who had almost no political experience. October 30th, 1961 Finland received a diplomatic note where the government of the Soviet Union proposed consultation on “actions to secure the borders of both countries from the threat of an attack posed by the Western Germany and those allied with it”. Finnish communists received a prior notice of the note one week earlier. Kekkonen could have repelled the demand for consultation by saying that there in fact existed no threat of an attack on Finland’s territory. Tehtaankatu hardly would have pressed the issue with Finland in the international situation of that time. But – as Finnish diplomat Max Jacobson has said – supporting himself by the opinion of Finnish majority against the USSR like Paasikivi had done was too “Tanner-like” and not an option for Kekkonen after his backstepping on the Night Frost Government. The diplomatic note worked well. Olavi Honka withdrew his candidacy, Finnish people were frightened, and Kekkonen was re-elected with a substantial electoral majority. Why was the note sent at the very time Kekkonen was on his most important visit to the West in his career up to then? Maybe exactly because of that. The diplomatic note was a multi-warhead missile that not only created circumstances for Kekkonen’s re-election but also showed the extent of the leash Moscow had Kekkonen in. Things were quickly back to normal during the next visit to Russia. Khrushchev and Kekkonen gave a joint statement that no military consultation was needed. During this meeting in Novosibirsk there was again no Finnish translators present in the discussions between Khrushchev and Kekkonen. The interpretation was provided by Vsiljev Zhenihov, a KGB chief. The feeling was that Kekkonen was being disciplined. Many Finns believed at the time – and many still do – that Kekkonen had in fact ordered the note. Kekkonen had turned to Tehtaankatu for support and he could expect some help from that direction, but the help that came was an overreach. Kekkonen was surely annoyed by a such a strong demonstration of “support and comradery”. This conclusion is also supported by the fact that journal entries are very brief on the Note Crisis. “I do not believe that the consultations that we probably have to agree to will cause any change in the status of Finland as a neutral country”. Not a word more. Kekkonen had read the “Russian hint” correctly. Kekkonen is impressed in the minds of the Finnish people as a man above all others. He was the man who appeared equal in negotiations with a cruel dictatorship and never gave in an inch more than was absolutely necessary. This is the image he himself crafted and aptly served us, his subordinates, but the truth may have been slightly different. Why was Kekkonen afraid? What was there in the special relationship between Kekkonen and the Soviet Union that scared Kekkonen? What kind of payback was Moscow expecting from Kekkonen? Political campaigning requires funds. Transfers of political money in the post-war Finland had became the way things were done. The communists received rubles from the USSR and the social democrats dollars from the West. Also Finnish businesses invested funds to limit communist power by siphoning them through SDP. Juho Kusti Paasikivi was a President with whom the Soviets could do business. But Kekkonen had an in with the Soviet intelligence agents. Agents following his activities would report in Moscow that Kekkonen was “a wise, clever and prudent politician”. “Kekkonen’s trademark is efficiency” stated a memo by the foreign affairs administration of the USSR. Kekkonen’s first presidential elections in 1950 were a tough fight. Vihtori Vesterinen (AL) tattle-tailed Paasikivi that Kekkonen had 3 million marks in his campaign coffers. “Where did the money come from?” Clearly not from the party. The highest nomination Finnish bill of 500 marks from 1975 featuring President Kekkonen. During the fray of the campaign, the position of the Soviet Union on the candidates drew attention. Paasikivi was hit very hard but there was no ill word said on Kekkonen. According to Hertta Kuusinen (first female member of the Parliament and a communist), Paasikivi never had been supportive of the friendly relations between Finland and the USSR. Paasikivi won the 1950 elections, but during the 6-year term the Soviet support for Kekkonen continued to strengthen. During the 1956 elections KGB agents Mihail Kotov and Viktor Vladimirov acted as counselors for Kustaa Vilkuna (AL) and Arvo Korsimo (the Party Secretary of AL) and were often seen by the Parliament building. Kekkonen became the President by an extremely tight electoral vote 151 – 149. The most disturbing documentation on the role that the Soviet Union played during the presidential elections of 1962 is in the minutes found in a Moscow archive. It states that Kekkonen had received 10 million marks for his campaign. The central committee of CPSU approved Arvo Korsimo’s request for that money. It was referred to as “additional support” that seems to point towards some established pattern of funding. Kari Hokkanen of the Centre party, who has studied the history of the Agrarian League, does not believe that Kekkonen’s carefulness with the Soviets could have been because of their involvement in financing his campaigns. “He had more cause to be wary of his past of anti-communism, of his time in the central police, and that he as the Minister of the Interior had placed communists behind bars on the eve of the Winter War.” This “official” history of the Agrarian League mentions Kekkonen’s finances only with great hesitancy. The history of political funding in Finland remains unwritten maybe because both the requestor’s and the giver’s reputation are on the line if the rumors are verified. Only in recent years have some leaders of the labor unions ventured to reminiscence how SDP’s right wing received funds from industry’s secret coffers for the fight against communism in the workplaces. Chairman Emil Skog of SDP knew already in 1956 to ask for some “financial assistance” from the Russian Embassy from the funds that Russians had given to the farmers. It was for his supporters in his party torn with internal quarrels. Those were most likely funds that Arvo Korsimo took care of and were not overseen by the official leadership of AL. Very likely relevant to this, a special Foundation of Agrarian Common Committee was formed in 1956; it was a project mostly tied to the AL members supporting Kekkonen. Korsimo’s home had a safe full of stacks of mark bills. “No receipts are needed here”, described he how the accounting was handled. The foundation was in the hands of trusted people. Its governing body in 1961 consisted of K. E. Kivivuori (chairman), Kalle Joukanen, Arvo Korsimo and ministers Kauno Kleemola and Ahti Karjalainen. The secretary was Jouko Loikkanen and the treasurer economist Reijo Vähätiitto. The accountants were attorney Matti Kekkonen and reporter Johannes Huumo. This Kivivuori’s enterprise had as a separate ‘black account’. “These funds outside the accounting were recorded by Miss N.”, had Kivivuori told his wife in the summer of 1961. This black account had so much money coming through it that it was siphoned through Switzerland. Skog and his followers founded a new party in 1959, the Alliance of Finnish Workers and Small Farmers, that was funded by rubles. The workers’ central union SAK, which continued to be controlled by the Skogs, asked and received a donation of 10 million marks from CPSU’s central committee in the fall of 1960. At the same time the other central labor union SAJ that was controlled by SDP’s remaining leaders, the Leskinen group, received dollars from the West. Even though it was widely known that Kekkonen and the Soviets collaborated in various ways – and rumors were running rampant – there was little hard evidence of these activities. If evidence had become public it would have been political dynamite. The collaborations that had continued for more than a decade resulted finally in Kekkonen winning the 1956 presidential elections. Had the funding from the USSR become a dependency that kept Kekkonen always on his toes? Kekkonen’s domestic political position during his first term has been typically described as weak. But was he particularly weak in his relationship with the Soviet Union? What was the Soviet Union buying from the Agrarian League? What may have been the moral issues for political financing in Finland? It seems natural that the Communist Party of Finland received funding from the USSR. The goal of the Finnish communists was the same as that of their Soviet counter part CPSU: turning the Finnish society and state into communism in one way or another. Just as understandable was that SDP and other parties that claimed to defend the western democracy received funds from the West. It was a matter of worldwide ideological battle during the Cold War and the ends justified the means. But why would the Agrarian League that claimed in its political programs to stand for private ownership and parliamentarism receive rubles? What did the Soviet Communist Party want in return? And what did it receive? There is always free cheese is in a mousetrap. A short English summary on Urho Kaleva Kekkonen’s presidency on Global Security website.